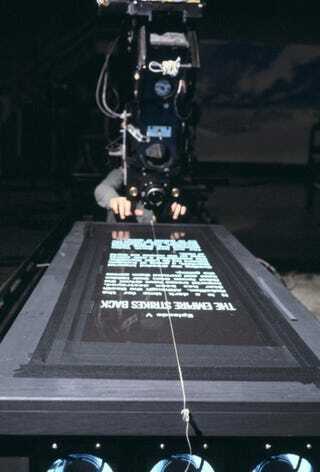 All these years I'd assumed George Lucas and his team of SFX artists had used some kind of obscure, obsolete compositioning technique to create the Star Wars' iconic opening crawls. The real method, pictured here, is wonderfully quaint. When I saw this setup, print in Esquire, I assumed they had built a physical crawl, dragged through the camera's field of view to create the effect. Looking closer, though, it's obvious that it was the camera that moved in this setup, slowly and carefully rolled back over the glossy, printed plate, which measured about six feet long. For an analog technique, the results were spectacular. Not spectacular enough, however, to escape the all-consuming digital restorations nearly 40 years later, in which Lucas had them replaced with computer-generated crawls.